General Rawat, while speaking to reporters at a function in Jammu, also said that the mountain strike corps, designated as 17 Corps, was being raised as a "force of deterrence" and the process of its establishment was on schedule. Jammu: Army chief General Bipin Rawat has said that the Army has to remain prepared to counter any Doklam-like situation along the India-China border. Asked if the 17 corps was being established to counter China, General Rawat said, "Why should we say it is against whom? It is for deterrence and deterrence is against any threat that may confront the nation." The Cabinet Committee on Security headed by Prime Minister Narendra Modi had cleared the setting up of the 17 Corps in the latter part of 2014. So far, one division comprising nearly 25,000 soldiers has been raised for the Corps, which is at present headquartered at Ranchi. Once the raising of the 72 division is complete, the Corps will be based out of Panagarh in West Bengal. Asked if there was any possibility of a Doklam-like standoff with China in any other part of the Line of Actual Control (LAC), General Rawat said, "We have to remain prepared". The 73-day face-off between Indian and Chinese troops in Doklam started on June 16 after the Indian side stopped the construction of a road by the Chinese Army. General Rawat, while talking to reporters on the sidelines of the function where he presented the President's Standards to 47 Armoured Regiment, also said that the security situation in the Kashmir Valley was improving. "I think the security situation in the Kashmir Valley is improving and what is happening now in the Kashmir Valley is possibly highlighting the frustration of the terrorists and those who are supporting them," he said. The Army chief said that the "ups and downs" in terrorism keep happening. "We will keep eliminating terrorists, and some wayward youth, because of the social media campaign of radicalisation, will come and join," he said, adding that most of them were now operating overground and were surrendering. Asked about the reopening of terror training camps across the Line of Control, General Rawat said that they were never closed. Terrorists were stationed in the training camps even then as they are today, he said. 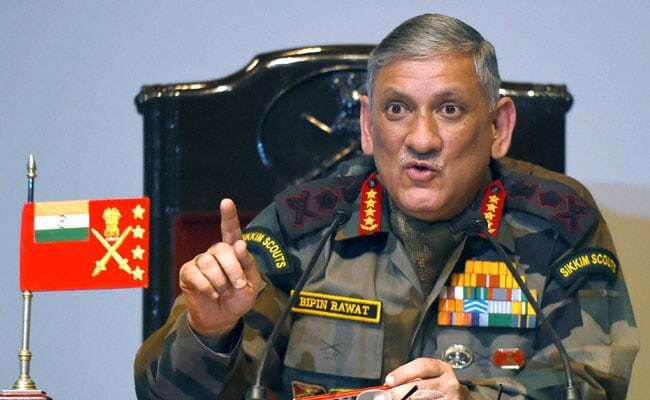 On whether the Army will again carry out surgical strikes to dismantle the terror camps across the border, General Rawat said, "We have already said that surgical strikes were a method (to deal with terror infrastructure across the border). There are other methods also." The Army chief also said that the enquiries into the terror attacks in Pathankot, Uri and Nagrota had been completed and action taken. "Punishments are being awarded to the people who are found guilty. Nobody is spared," he said. Asked about his reaction to the statement of Pakistan Army Chief Qamar Jawed Bajwa that his country wants to have peaceful relations with India, General Rawat said the military has a task and it will continue to perform the task. "Any talks or anything that has to be done, will be decided at the political level. If the political hierarchy takes a political call, we will continue to perform and do our tasks that has been entrusted to us," he said. Talking about whether the militancy graph has gone down after initiatives under the 'Operation Sadhbhavana', General Rawat said, "Winning hearts and minds (of people) is part of any counter insurgency strategy and our nation has been following it rightly." "Success has been achieved through Operation Sadhbhavana which is evident the way you see the goodwill of schools in carrying out competitions. There are any number of people joining and supporting the campaign," he said. Asked whether the Army was planning to close down Army Education Corps, General Rawat said the instructions to close it down had come. However, he also added that, "If we have to close down AEC, it will take time. It is being discussed. The AEC is a programme run by the Army that develops soldiers and officers of all ranks in a variety of disciplines. The centre provides education in both combat and non-combat operations. General Rawat said action was being taken to secure all military establishments and garrisons.